Chutney is a common ingredient in making chaat recipes like Sev Puri, Bhel Puri, Ragda Pattice or Paani Puri. 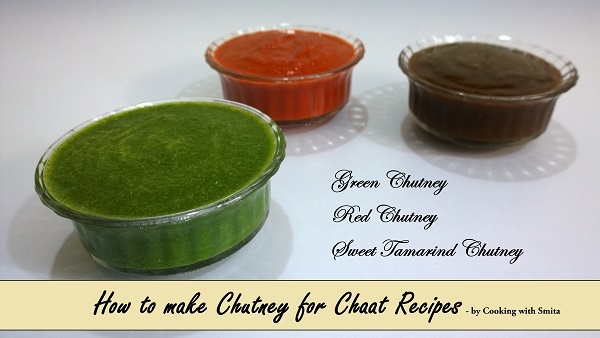 I am sharing various types of Chutney for Chaat recipes which are easy to make and with fewer ingredients. You can use these chutneys in making all types of Chaat, like Green Chutney, Red Garlic Chutney and Sweet Tamarind and Date Chutney. Rinse the Coriander and Mint leaves in water and roughly chop them. Add all the ingredients in mixture jar. Add some water (2 – 3 tbsp.) and grind to a smooth chutney. Remove the chutney in a bowl and use as required in Chaat recipes. You can refrigerate and store Green Chutney in an airtight container. Consume within 7 to 10 days. This chutney is not that spicy as I have added just 1 tsp Red Chilli Powder but you can increase the quantity of Red Chilli Powder if you want to make it spicier. Add all the ingredients in mixture jar – Garlic, Kashmiri Chilli Powder, Red Chilli Powder and Salt. Add some water ( 3 – 4 tbsp.) and grind till you get a smooth paste. You can refrigerate and store Red Garlic Chutney in an airtight container. Consume within 3 to 4 days. Heat 1 cup water in a pan over medium flame. When water is slightly warm, add Dates and Tamarind. Heat over medium flame till water starts boiling. When water starts boiling, lower the flame and let it simmer for another 2 minutes on low flame. Switch off the gas after 2 minutes. Add Jaggery, mix well and keep it aside for 30 minutes and let cool down to room temperature. After 30 minutes pour the mixture in mixer jar, add salt and grind. Strain the mixture using a strainer to get the smooth paste. You can refrigerate and store Sweet Tamarind and Dates Chutney in an airtight container.